…Sign up to receive Wireless AMBER Alerts on your cell phone! I’m sure many of you must already know about this one, but I just found out about it tonight…..
For anyone who is not yet familiar with the AMBER Alert System, it’s a “quick response” system developed to get the word out when a child has been abducted. Authorities say that the first three hours after a child has been abducted are the most critical hours in which the chances are greatest for a rescue, so spreading the word quickly is vital. Here in the greater Phoenix area the DOT has put up a number of special signs along the freeways as well as major streets, that flash Amber Alert information as soon as a report is called in. It will generally display information on a make/model/color of a vehicle if witnesses can report that, sometimes even a license plate number, other times just a description of the child and/or the suspected abductor. But what about when you’re not in your car driving around to see the signs? Or not watching the news stations? How about if you’re at the mall, ballpark, beach, or elsewhere? Getting these alerts on your cellphone could possibly help save a child’s life. Sure, cell phones give us a lot of convenience, but I can’t think of a better use for technology than helping save someone. Signing up is easy – I just did it…….you just enter your cell phone, accept the terms, enter from 1 up to 5 zip codes (if you travel extensively you may want to enter more than 1, but only your home zip code is needed to enroll for the whole city in which you live). That’s it – they’ll send you a text message to confirm your enrollment. Technology is a wonderful thing…….even better when it can help reunite abducted kids with their families. 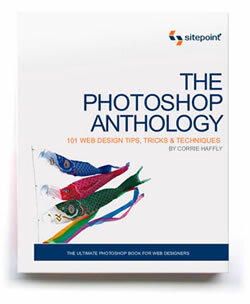 Free Photoshop Anthology PDF – Hurry! Attention all web designers and graphic designers – if you’re a new Photoshop user you will NOT want to miss out on this terrific opportunity to pick up a FREE pdf that is packed with easy to follow tutorials, tips, and tricks on using Photoshop to it’s fullest. Even if you’ve been using Photoshop for a while, you should take advantage of this opportunity to see if you can learn a new trick or two – what the heck, it’s FREE! (A savings of $29.95). Grab this freebie, The Photoshop Anthology (101 Web Design Tips, Tricks, & Techniques), while you can – it’s a limited time offer, so don’t delay. Did I mention that it’s FREE? The author, Corrie Haffly, is an expert Photoshop user, author, and regular contributor to SitePoint. I love Corrie’s advice and tips in the Design View e-newsletter I subscribe to, and her articles on the SitePoint website have taught me a lot about graphic design. For anyone who is not a regular reader of this site, SitePoint is my favorite resource for web design books, video tutorials, and general reference material. I own (and use almost daily) many of their books, learn something new from them with nearly every issue of their newsletters, and I use their HTML Reference pages and CSS Reference pages on a regular basis. I especially love their Reference pages because I can use them when I’m on the road (and don’t have their books with me) and need to look something up. Every Web Designer should be a regular visitor to their site! Want to learn more about CSS? Find something useful here? For just a buck (yes just one small dollar) you can tip me, and be in my Top Spots widget! The coolest thing in site traffic reporting since, well since site traffic reporting was invented! © 0 - 2019 Tech-Kitten.com. All Rights Reserved.